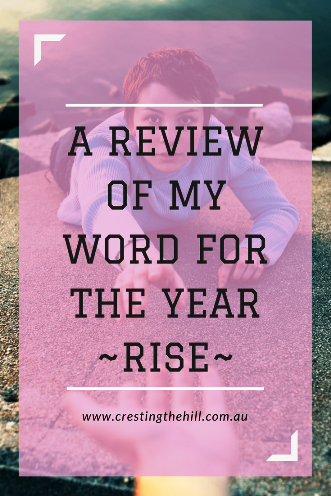 Six months have zoomed by and it's time to check in on how I'm doing with being inspired by my word for the year - RISE. I mentioned last year that when I chose ENOUGH as my word for the year, the meaning morphed as the months passed. It moved from having enough to being enough. I think the same thing is happening with my word RISE - as time has healed some of the wounds from last year, I've come to appreciate that we can rise in so many other ways. Rising to be our best selves is one of the new definitions for me. I came across a beautiful quote from Laura McBride - which incidentally comes from her book "We Are Called to Rise" and it speaks of the small things, the incidental actions, the little sweetnesses that we can all participate in. These little acts of kindness and care create in us a heart that looks to putting others first and seeks ways to make our world a little bit better. As we rise up and invest in others, it has a domino effect and what we model becomes the new normal to those who come behind us. As the Robert G. Ingersoll quote goes - “We rise by lifting others” and what a great legacy to leave behind. I've come to see that we grow by small steps; each time we rise to the occasion, each time we choose the better and kinder option, each time we think about others before ourselves, we Rise. Midlife is the very best time to do this (if we haven't started already). We have the time and the wherewithal to be able to invest into the lives of others. We have aging parents who need us to slow down and listen, we have grandchildren who we are allowed to spoil and make special, we can pause a little more often and find time for friends - and for strangers. All the things Laura mentions above are tiny little actions, but if we all made the effort to do at least some of them, how beautiful would life be? How much more valued would we all feel? How much better would our world be? It's incremental and it builds up and changes us - as we rise up and choose to make a difference, everyone benefits. Did you have a word for the year? Are you finding it's making you rethink your definition? Do Laura's words inspire you to Rise Up and make a small difference in your world? Mine was heart & I've done very little in the last few months to improve the health of mine - although I am back in a good walking routine and creatively and relationship wise my heart is happy...Thanks so much for the reminder! I think having a happy heart and a good walking routine means you're pretty much on course for your word too Jo - onward and upward! I loved her words Min - such a reminder of what a difference the little things make in the life of others - it's not about picking up after people, but about being the bigger person and doing the little background stuff - something we can all do to make a difference. I'm inspired by this post and your word for the year, Leanne. I agree with Min, Laura's words are so inspiring. I'm glad you liked them SSG - they really spoke to my heart and were a great reminder for me of how important the little things in life are. Funnily enough, 2 of the 4 Bible chapters I read this morning related a bit to this post! The first was Proverbs 21:21 "Whoever pursues righteousness and kindness will find life, righteousness and honour." I find it interesting that several thousand years after this was written, the same principle still applies - if we want to "rise" as you put it, then part of that is about lifting others up with kindness. The quote you used helpfully fleshes this principle out a bit more. The other part about "rising" that struck me as I considered the word was in my other bible reading, 2 Corinthians 4:13-14 "Since we have the same spirit of faith according to what has been written, 'I believed, and so I spoke,' we also believe, and so we also speak, knowing that he who raised the Lord Jesus will raise us also with Jesus and bring us with you into his presence." This gives even more meaning to your word for the year! Isn't it wonderful for us as Christians to know that because of Jesus, we are raised up - from spiritual death because of sin, to new spiritual life in Him now, and then to new physical life in eternity with Him when we die. That gives such hope when we experience trials and feeling beaten down - knowing that God both has raised us and will raise us up at the last day and there is therefore no fear of death. I loved that my word tied in with your readings FDIL - I often find that there is a synchonicity in life and the Word - little things interconnect and reinforce each other. It's also about letting something personal spread out to others and ultimately everyone benefits from it - you really can't rise without lifting others if you're doing it well! I really appreciated the poem - I disagree with you Leannne ( shock !!!!) I dont think the little things the tiny actions are really so little. Indeed I feel there is not a lot of difference between a 'tiny' and a 'big' action - for instance for me to receive one of these 'kindnesses' at a crucial point in my life could mean a great deal for me ,not that I think we should go around thinking we have done something great because we wiped the counter or made a bed. the depth is in the detail - rising up into the truth of your self Leanne - great word . I dont have a word for the year - but I am playing with dignity at the moment and it is true that as you deepen your understanding it can and does lead you into hitherto unknown areas. I completely agree with you Sandra - and you know that I refered to them as "little" actions, but the underlying concept was about how much difference these tiny things can make in the right time in someone's life. Simple kindnesses and small acts of service raise the spirits of those around us and in turn we enjoy knowing we helped and made a difference. I like your word "dignity" btw - something you are definitely showing at this time in your life. Gosh, that quote is so heart warming. It's funny that you think about your word halfway through the year. Because I was just telling someone my word too, and yet you don't hear many people talk about them now...it's more at the start of the year. When I see the backdrops you've been choosing for your posts (and your little props you include occasionally) I think "fun" is the perfect word for you this year Jodie. It lifts your spirits and adds a bright spot to your day doesn't it? This is so touching and I needed to read something like this. I pray daily and find strength in the lord! Have a wonderful weekend! I'm glad you enjoyed it Maria - it can be such a simple thing that brings a little joy into the life of the person you've encountered but it can have an ongoing ripple effect - I think that eventually comes full circle and we all rise together. You'll have to go back to your journals from the beginning of the year and see if you jotted anything down Alana - I'm sure you'll find it tucked away neatly somewhere. That quote touched me deeply. Thanks for sharing it Leanne. On another note, I just cannot believe that we are more than six months into the year. How did that happen? I know! Where did the year go?!! Soon we'll be discussing Christmas! I'm glad you enjoyed the quote - it was really special wasn't it? 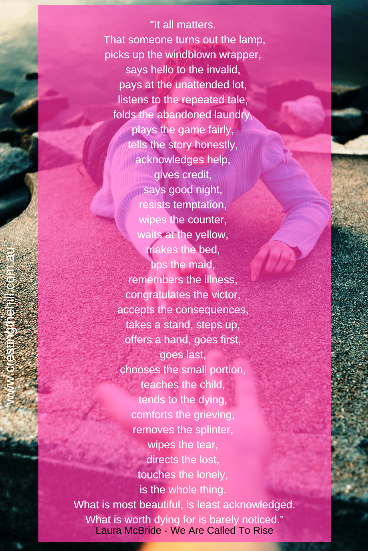 I love the poem, Leanne and it is so true that even small acts of kindness help us to rise and become a better person. My word of the year is Thrive and through my Over 50 & Thriving series, I have learned so much about thriving from wise and wonderful women. I can't believe we are into the second half of the year! Hi Leanne, it's me Susan Millard (under my Google account instead of my WordPress account.) I love, love, love that quote by Laura McBride. I also believe that our word of the year morphs as time goes on and healing happens or events happen that change what that word means for us. Life is fluid and every day, every experience changes us...how can it not? I try to rise daily by making a difference in someone's life (if not that then why are we here?) I like the saying "If you see someone without a smile, give them one of yours." We never know what someone is going through and that one smile could make all the difference in their world. I will be coming back to read some more of your posts as time permits. 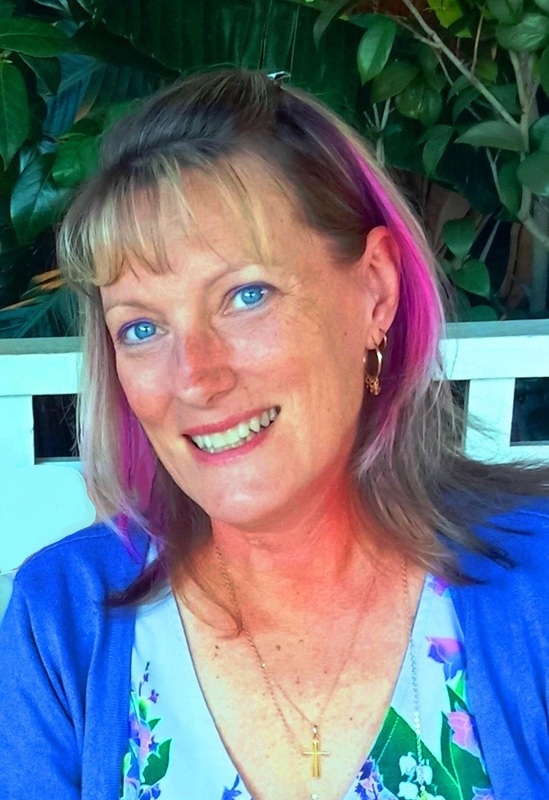 Hi Susan - it has been great connecting with you through Karen's blog and I'm so glad I had the chance to guest post there and meet some more blogging Midlifers. I never get tired of finding new people who share connections with me - similar life journeys and similar Midlife goals - it's been an amazing time of life and I think my word is reflecting that in different ways. 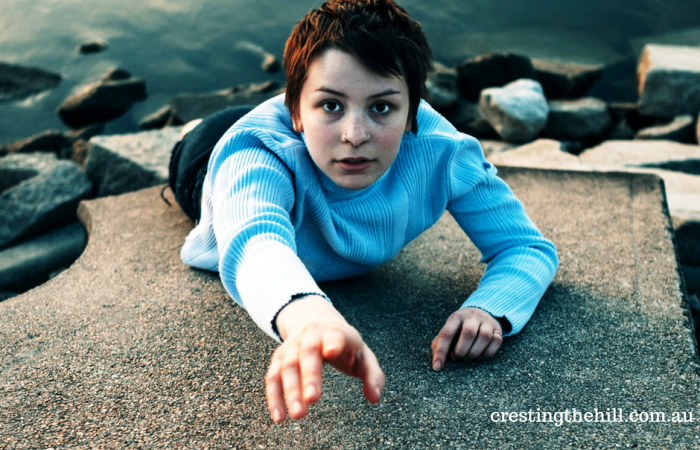 Midlife is a great time for the word "rise." Do you know the lovely song by Andra Day, "Rise Up?" it is an empowering song and beautiful. My word this year is light- I hadn't thought of doing a midterm reflection. I don't think I have achieved a feeling of lightness yet, though I am working on not letting things get to me so much and not over worrying or stressing so much. I hadn't heard it Michele - just youtubed it and it's certainly a powerful anthem isn't it? I actually thought about using the word "Light" and may choose it in one of the coming years - it has so many interpretations doesn't it? My word of the year is "explore." My travel budget is next to nil, so I didn't mean explore the world as much as I meant exploring new ideas, feelings, ways to be creative and such. Maybe exploring is a precursor to rising? I think that's so true Kathy - our roles morph and new challenges arise, but a lot of our previous roles still exist (in another shape and form) and we rise up to new ones. I didn't intend to pick a word for the year, but I ended up with "Patience" -- which I too often lack. It's come as a shocking realization, at this age, that I have to keep trying to be a better person. ;-) But I suppose it's what makes us human. We can't be perfect, but we can always continue to work toward being kinder, gentler and more patient. Patience is a big one for me too - I hate it when I see myself being less than gracious to an "annoying" person - they're usually doing the best they're capable of at the time, so me extending a little grace towards them certainly wouldn't kill me! Your focus has certainly been on distant horizons for the last few months Deb - and you've made the most of a wonderful experience - making us all a little envious in the process! I've really enjoyed looking back on my word and reconsidering it - that quote just seemed to encompass what I've been thinking about really well. Love the quote Leanne and agree it is so important to do the "little things"! Also a great reminder to stop and think about my word-of-the-year. I had been quite intentional with it until recently...so I will re-boost my efforts with it (probably as part of my mid-summer bucket list review and re-energize). I'd love to see you do a (slightly later than) Mid Year review of your word too Pat. I find it interesting to see where I thought I'd be going and comparing it to what has actually eventuated - it always gives me a nice surprise! Hey Leanne... you really did inspire me. I did a mid-year/mid summer review! Thanks!! Leanne, this is so powerful. I love (and agree with) your comments about midlife being that time to rise up. I think - for me - it's cos it's about a time of RE-assessment... perhaps that half-way thing and we do realise time is precious and we can't wait! I feel the same way Deb - it's like I'm suddenly aware that I'm past the halfway mark and life will keep getting shorter - what am I doing with the time I have left? My words for the year are Nice Surprises. I try to capture them monthly and I am amazed at how many I've had. I like the idea of rising to be our best selves. visiting via the Lovin'Life linkup. Leanne, I tried to let my word for the year come to me, and nothing came this year. It's July and I am still waiting....I appreciated Laura's poem you shared. I am not perfect at it, but I try to live by most of those 'random acts of kindness'. When my children were little, one asked why we always stopped to help people. My response: It's just what you do. Thanks for the reminder. How lovely that you were consistently kind enough that your children noticed Janet. We're usually in such a hurry that we forget to do those little kindesses and they are what make all the difference in our world today. Oooh! You've reminded me to have a bit of a review of my word of the year. Thanks for the reminder! Laura's quote sounds so inspiring. Last 2 lines "What is most beautiful, is least acknowledged. I just loved how beautiful it was when she put all those little actions together and it became such a wonderful thought. Small deeds can make all the difference can't they? My word for the year is BREATHE and my goodness I've had to stop and just breathe more than a few times, we've had a house guest for 19 weeks and 6 days (the fact that we can tell EXACTLY how long it was tells you what the experience was like) and it's been full on!